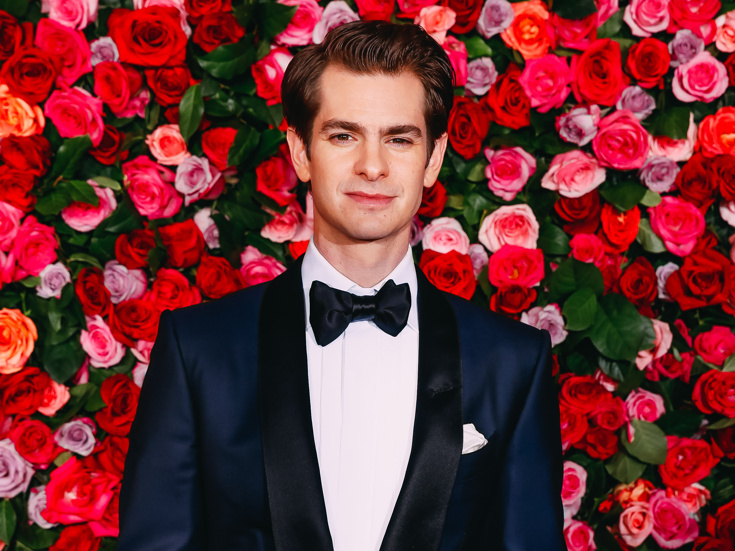 Andrew Garfield Wins Best Leading Actor in a Play Tony Award for Angels in America: "We Are All Made Perfectly, And We All Belong"
Angels in America star Andrew Garfield has garnered his first Tony Award! The Oscar nominee's incredible performance as Prior Walter in Tony Kushner's landmark play earned him a trophy at the 72nd Annual Tony Awards at Radio City Music Hall on June 10. Garfield won over fellow nominees Jamie Parker for Harry Potter and the Cursed Child, Tom Hollander for Travesties, Mark Rylance for Farinelli and the King and Denzel Washington for The Iceman Cometh. Angels in America is playing at the Neil Simon Theatre through July 15. "It is the profound privilege of my life to play Prior Walter in Angels in America because he represents the purest spirit of humanity, and especially that's what the LGBTQ community," he said in an emotional speech at the podium. "It is a spirit that says no to oppression. It is a spirit that says no to bigotry, no to shame, no to exclusion. It is a spirit that says we are all made perfectly and we all belong." "So I dedicate this award to the countless LGBTQ people who have fought and died to protect that spirit to protect that message for the right to live and love as we are created to," he continued. "Tony Kushner thank you for being the Angel of America that we all wish that we could live in, that we all dream of living in one day. Marianne Elliott I adore you. You are my queen and all of our queens. Thank you so much. This incredible company. You are all geniuses in your own right. To my own personal tribe, to my mom and dad, I share this with you. We are all sacred and we all belong. So, let's just bake a cake for everyone who wants a cake to be baked! Thank you so much!" Tony Kushner's Tony-winning two-part drama began performances of its first Broadway revival on February 23. Marianne Elliott directs the pair of works about the early years of AIDS—titled Millennium Approaches and Perestroika—which officially opened on March 25 at the Neil Simon Theatre. After appearing on stage in the UK in Romeo & Juliet, The Laramie Project, The Overwhelming and Beautiful Thing, Garfield earned a Tony nomination in 2012 for his Broadway-debut performance alongside Philip Seymour Hoffman in Death of a Salesman. His on-screen breakout role came in 2010 as Eduardo Saverin in the film The Social Network. Garfield next landed the coveted title role in The Amazing Spider-Man. He garnered an Oscar nomination in 2017 for his performance in Hacksaw Ridge. Listen to Garfield talk about the "privilege and burden" of playing Prior Walter on Show People with Paul Wontorek. And hit the red carpet with him and the company on opening night.